YEA~~~ I DID IT! I DID IT! I FINALLY DID IT! 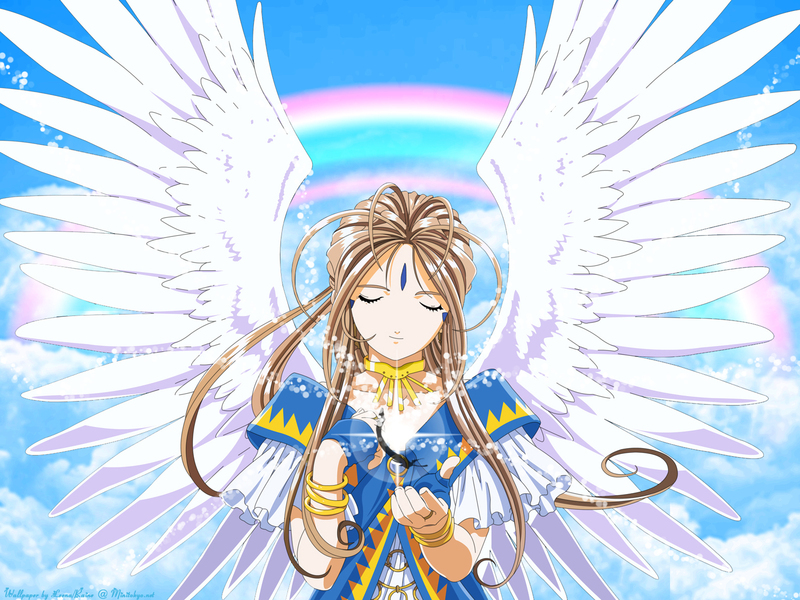 anyway *ahem* i finish my wallpaper of Belldandy. Don't ask me how longI take to do it but I feel like i have been doing it for months. So lets start the wallpaper. For the cloud bg, I got a bit help from my sister. We took a picture of clouds to be a reference so I guess it has a bit of similarities. I am very proud of our clouds. Actually, the best I can make. the rainbow is okay for my first try. The extractions was redone many times since I am not too satisfy. But the extractions gotten easier as I go a long. last is about the words, i am not sure if is better to be there or not. Anyway, do u know where I got the title from? u guessed it, it is the OP from Ah! Megami-sama. I have been listenning to that song and the english translation lyrics since i started the wallpaper. So, credits to my sister for helping me, aNIMe for the lovely scan, fonts from 1001fonts and a few tutorials. Made the clouds wider. without the clouds looks a bit plain at the back. [edit2] Delete the word since many of you says is better off without it. [edit3] Put more clouds in like white-zero said. Later, there will be more updates like birds and etc. Until then, take care. It will be better if you add some birds and more clouds at the back. And I think this piece looks better without the text. A very good effort. Keep up the good work. Love your wall...it turned out great! But I don't think you really need the rainbow there. Belldandy always looks beautiful. I think the wings and how you can see each of the larger feathers that is a nice touch, in addition to the black feather and the rainbow I think is just another nice touch to show she is a goddess rather then an angel. Cool job on this one. Yup. The wall looks better without the text. You can try add some mist around here though. The bg is really made me feel comfortable. Quote by white-zeroYup. The wall looks better without the text. You can try add some mist around here though. I likie very much! I love the pastels you used in the bg. Very serene and peaceful to match the wings. Well done! Nice wallpaper you have made there. Everyone must see this so that they can see it. I love the BG and it makes me feel inspired to draw again and also It`s my first time to see your work. Keep it up!